A Hen Do needs to be a night that the girls can keep in memory for many years to come, full of laughter, embarrassing stories and booze! This Essentials Tin is on hand to offer the storage for any bits and pieces a Hen party may need to make the bride-to-be’s hen night the biggest success! Shaped into the classic tin-made rectangular fashion, this tin contains a plentiful amount of room to store such things as brushes to booze, makeup to medication, you can really fill this tin with absolutely anything, any woman could want! 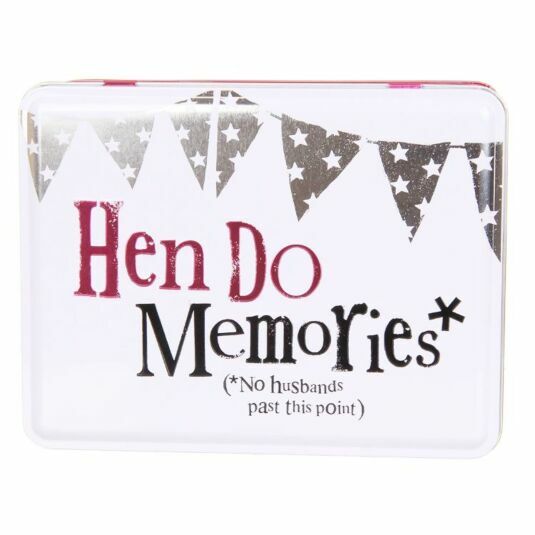 This tin is beautifully decorated on its lid with the words ‘Hen Do Memories* No husbands past this point’. Star detailed bunting lines a corner of this tin, with the base of the piece decorated in a star patterned, vibrant pink background. This tin is also hinged for easy access and so after a few drinks you don’t end up losing the lid! 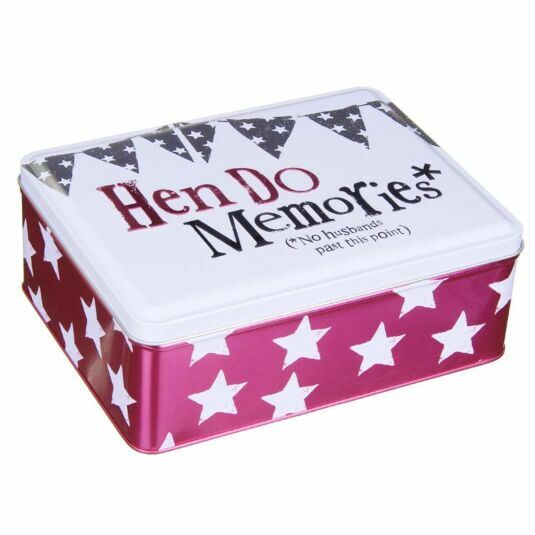 Keep your hens happy on the big night before the big day with this super handy and super stylish Hen Do Memories Tin from the Bright Side, the perfect right hand man (aside from the groom) to help a women’s night go off with a bang!